Even though it’s still the middle of winter, I was craving some nice cream. I wanted it creamier than normal nice cream, so I used canned coconut milk and that did the trick! You could use bananas instead of coconut milk, but the consistency wouldn’t be the same. I seen on tv that strawberries and pepper go well together, so I tried it in nice cream and it is so good! 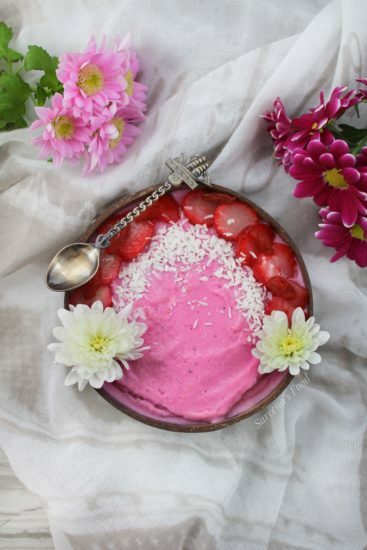 The spiciness of the pepper and the fruitiness of the strawberries are a great combination! This recipe is so simple and tastes fantastic, one of the many reasons I like it! Start by crushing the peppercorns and the pink himalayan salt crystals together in a mortar and pestle. The salt adds a lot to the nice cream, so I wouldn’t omit it. When the salt and pepper are ground up, add everything to the blender. I added pink pitaya powder to get the wonderful pink color (it adds to the flavor too!) You then can pour into the ice cream maker. It only takes 10-15 minutes in it to set; if you don’t have one though, freeze it in a container for 2-3 hours. 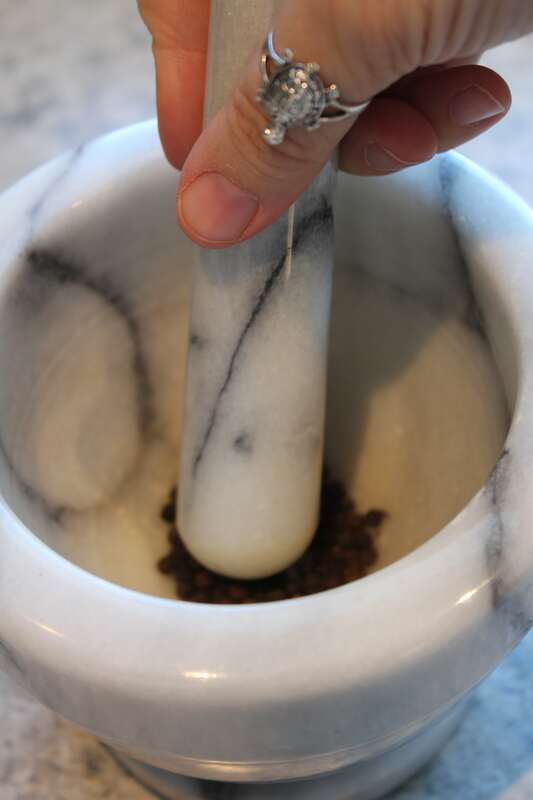 In a mortar and pestle, crush the peppercorns and the salt until ground. Add all the ingredients to a blender and blend until well combined. Pour into an ice cream maker and let churn until desired consistency; approximately 10-15 minutes. If you don't have an ice cream maker, pour into a container and freeze 2-3 hours. This has great flavour and the peppercorns really makes it pop! I never thought that pepper and ice cream would ever go together, but it’s amazing! A great fresh strawberry flavour. The pepper adds a nice bite. 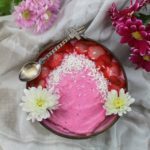 For even more recipes and photos, please follow me!